January 1943. "Freight train operations on the Chicago and North Western Railroad between Chicago and Clinton, Iowa. The train rushing through the town of Cortland Elmhurst, Illinois, on its way to Iowa." Medium-format negative by Jack Delano for the Office of War Information. View full size. Submitted by CGW on Thu, 12/11/2014 - 7:13am. Those horizontal signal heads were a peculiarity of the CNW, though they display perfectly conventional color light aspects. Another distinction hidden in the photo is left-hand running. 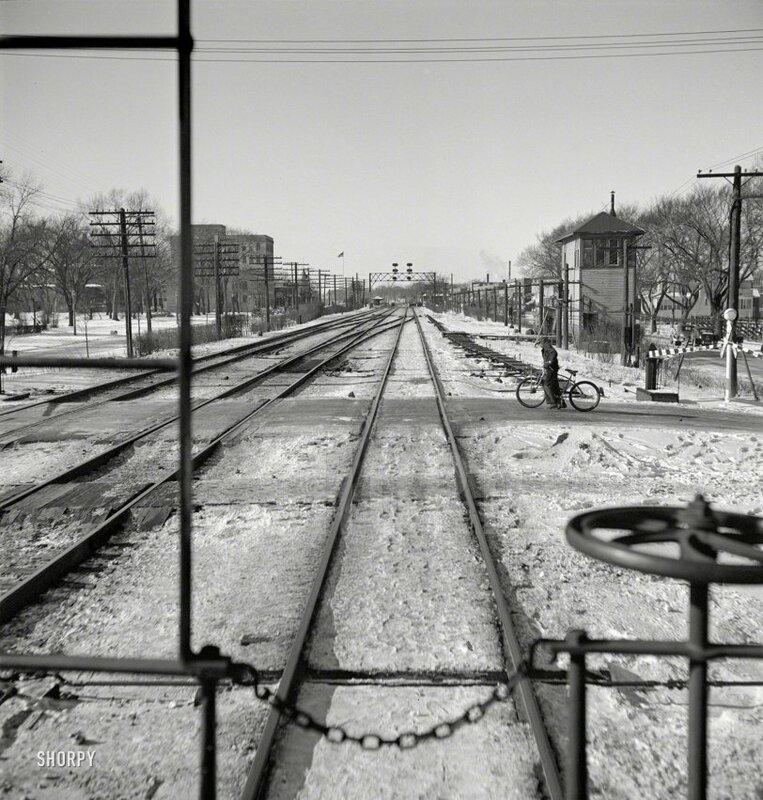 When the main line was originally laid, the stations tended to be located on the south side of the tracks; when they double-tracked, the second track was laid on the north, and eastbound (to Chicago) traffic stay on the south track because commuter traffic would prefer to wait in the station inbound in the morning. Thanks BTW for the location update. I couldn't square the photo with Cortland but I couldn't quite convince myself it was Elmhurst either. Submitted by Wayne Johnston on Wed, 12/10/2014 - 10:41pm. It looks like grubemed is correct. Here's the street view looking west from Haven Road in Elmhurst, IL. About two blocks west you can see the five storey building on the left of the photo. Submitted by Chuck1945 on Wed, 12/10/2014 - 2:47pm. Train is eastbound through Elmhurst, probably entering Proviso Yard. The tall bank building and other buildings can be seen on streetview. The track layout has not changed much over the years. Submitted by grubemed on Wed, 12/10/2014 - 9:19am. I'm fairly certain that we are in Elmhurst looking west towards the station from about Haven Road. If correct, that means the train is heading east, not towards Iowa. Maybe someone could link the Google street view? Nice photo, though. Submitted by Kelpie on Wed, 12/10/2014 - 8:23am. Looks like the kid in the picture is riding an old Schwinn prewar bicycle. Likely an old DX frame style before they came out with the cantilever frame.